Norway is home to Europe’s largest sub-arctic plateau, the Hardangervidda. 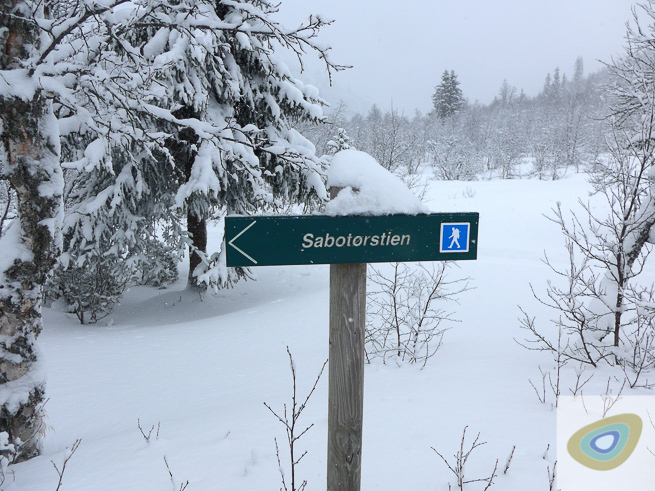 With an average height above sea level of 1,100m, this area of southern Norway is cold and exposed to the elements in winter. 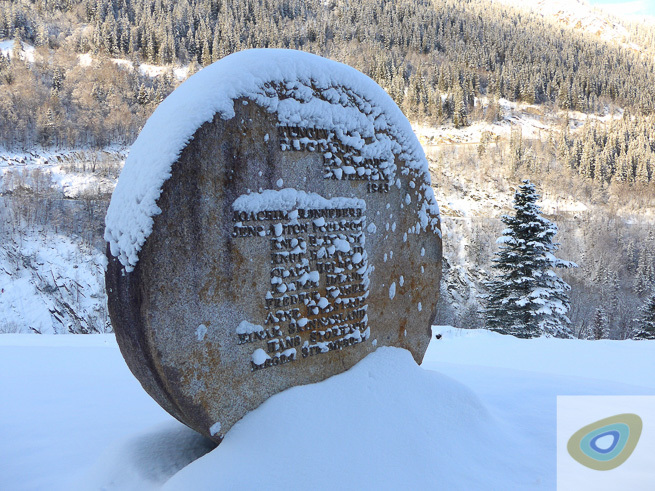 On the South-Eastern edge of the Hardangervidda the town of Rjukan lies in a deep sunless valley. At the top end of this valley is the Vemork Hydro power plant, site of one of the most daring sabotage raids of the Second World War. 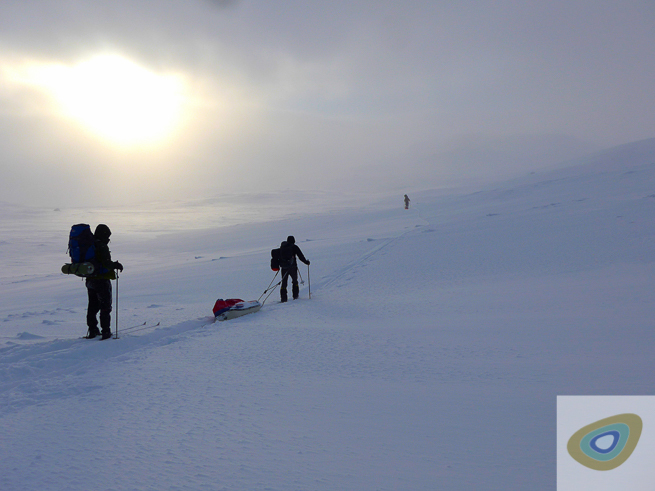 A group of friends and I travelled out to Norway to do a winter camping ski tour in the land of the saboteurs. 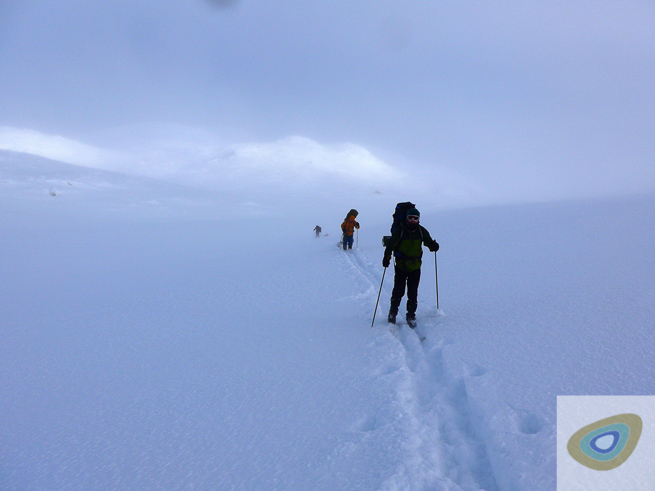 We decided to start our ski tour at the point that the saboteurs exited the Rjukan Valley back on to the Hardangervidda plateau and to follow partly their escape route and partly their attack route over the following week. Our aim was to get up on to the plateau before nightfall, and having already had a busy day organising the planning of our trip we knew that we would only just make it out of the tree line before dark. 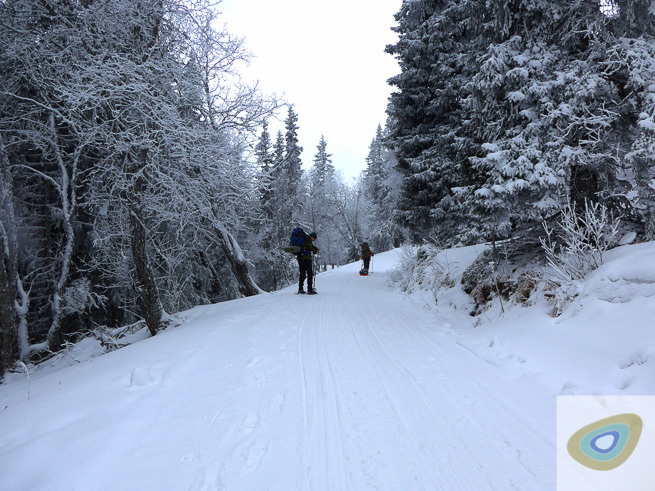 The hardened and compressed paths of the snowmobiles made it easier for us to walk up to the plateau with our skis strapped to the pulks. 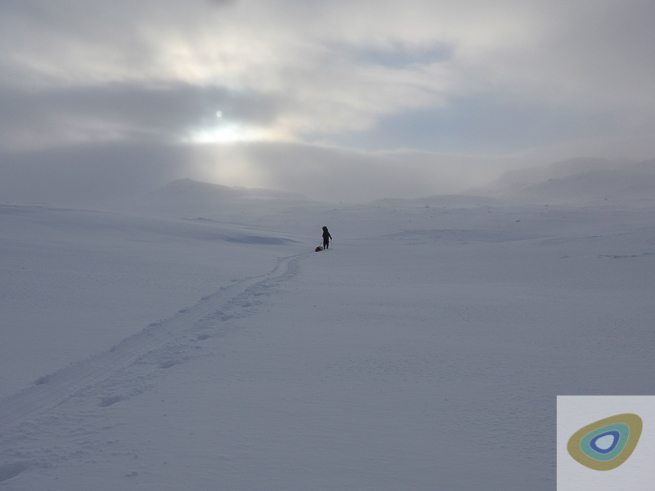 These paths only went so far and so after a few kilometres we put our skis back on. We were very careful not to get too hot pulling the pulks as sweating in such an environment is inviting real danger. Constant adjustments of our clothing were made to keep us just on the right side of cool. 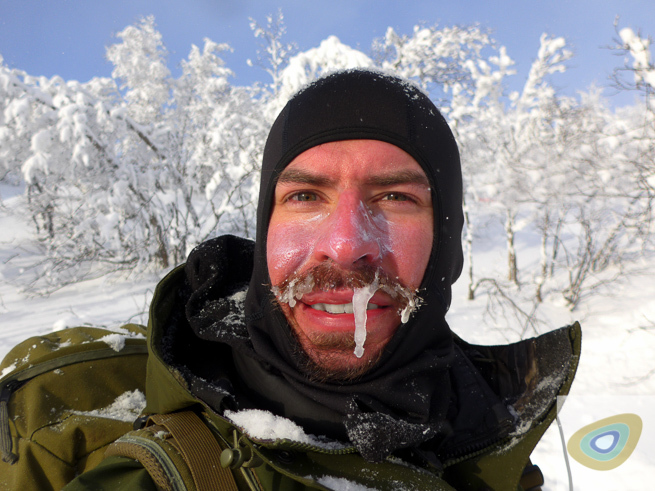 Generally, the rule of this sort of trip is: Be Bold Start Cold! Meaning; it is best to be chilly at the beginning of a day’s skiing that to sweat and be damp later. This is especially important if you are not sleeping in heated tents or huts, because it is difficult to dry your kit out at the end of the day. We made it to the plateau and continued for a kilometre or so to the first flat spot we could find to put up our tents. 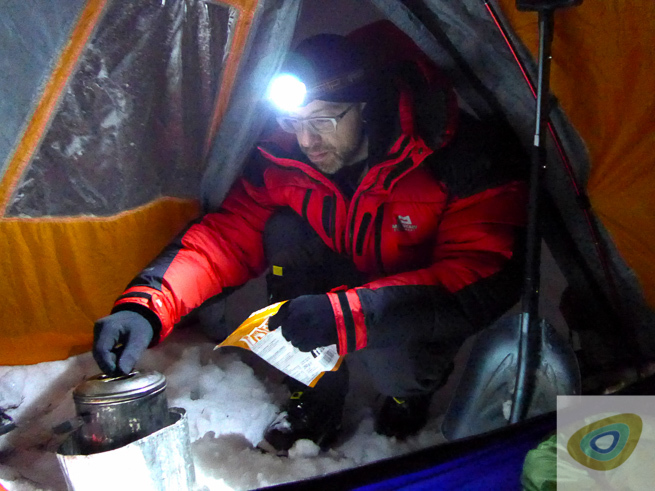 The stoves were lit and pots of snow with some water from our flasks were set to melt for our dinner. It is very important to add some water to the pots of snow, snow is a great insulator and if left in a pot, the bottom part of the snow will melt but the top will form a seal and not melt which at worst can damage your cooking pot and at best is a waste of precious fuel. So, we made sure that we had some water left at the end of each day to help with the snow melting process. 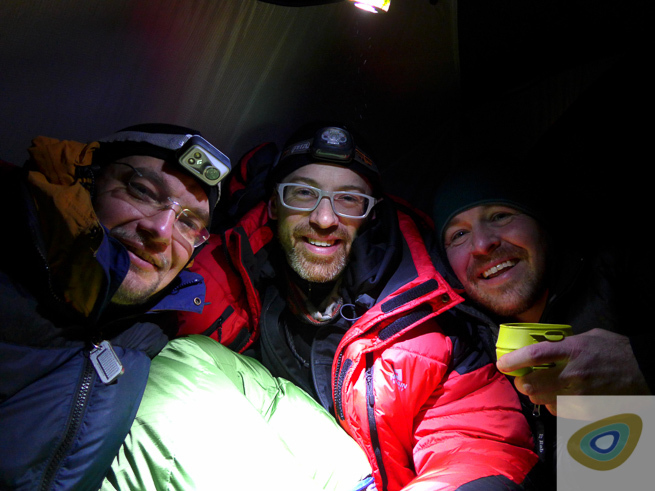 Once we had eaten, the team gathered in one of the tents to enjoy a cup of tea together and discuss the details of the next day. Humidity from our breathing was one of the main sources of moisture in our tents. 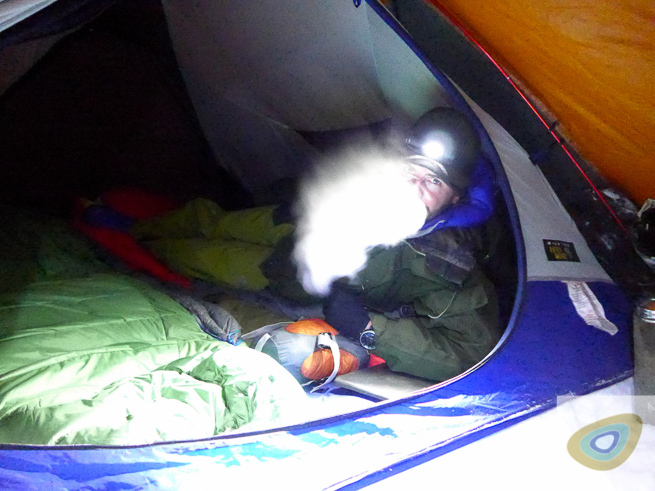 This humidity becomes a problem as it condenses on the inside of the tent and on our sleeping bags. Once condensed, the moisture turns in to a sort of snow, meaning if you touch the inside of the tent, it falls on you and your kit and can melt and get into your sleeping bag and clothing. Most of our warm layers and sleeping bags were made of down; fine duck feathers that are incredibly good insulation and yet light to carry at the same time. The only problem with down is the more moisture that gets into it, the less effective it is at keeping you warm. We generally lose about 500ml of liquid each night as we sleep from our bodies into our surroundings in a cold environment, and again getting too hot and sweating into your sleeping bag can create problems later. There are methods to prevent this happening, and there are things you can do to manage your winter sleeping. The next morning, we performed our morning routine which would become very familiar and slick by the end of the trip. 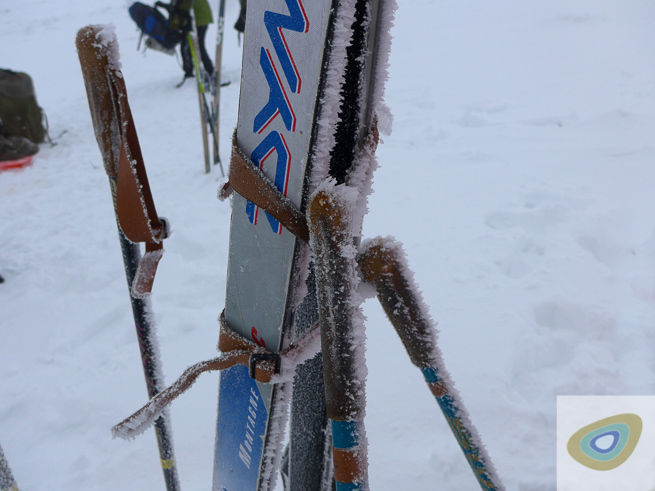 Once we were up and packed, we found our skis to have been encrusted with ice crystals born on the wind overnight. 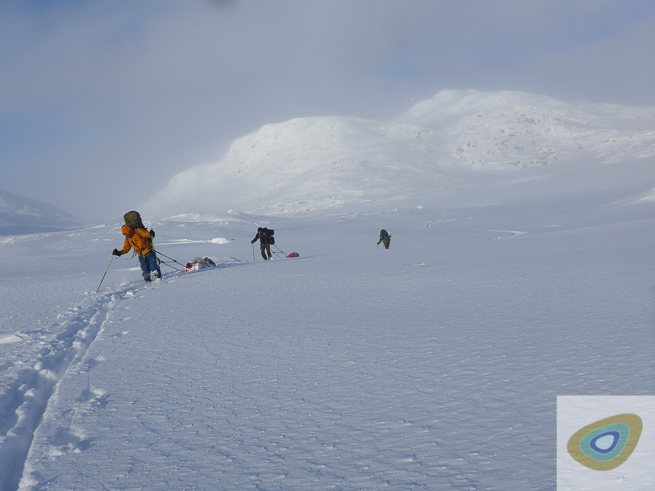 We took it in turns to pull the pulks, but sometimes a whole day would pass with one person pulling and one person breaking trail and navigating. The extra effort and concentration need to pull a pulk makes navigation difficult, so, the navigator didn’t pull the pulk unless there was a clear path to follow. We continued skiing North all that day, stopping only briefly for drinks from our flasks and for a very quick lunch. While you are skiing the muscles in your body generate heat, especially when exerting the extra effort needed to pull a pulk. As soon as you stop, your body cools down very quickly, so breaks are necessarily short. If they were to be longer than 5 or 10 minutes we would take out our big down jackets to keep us warm. 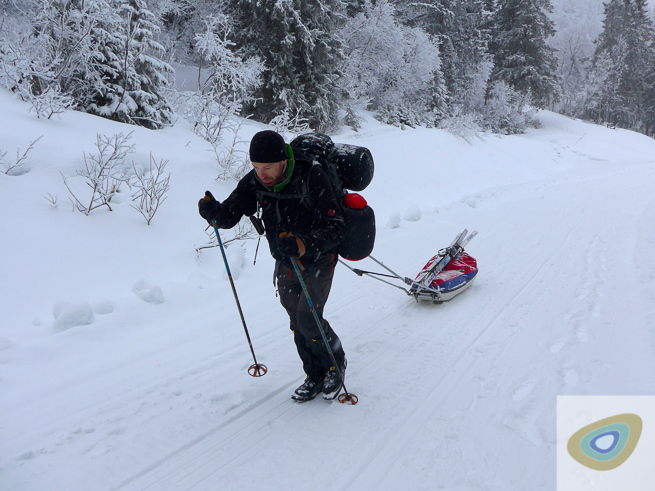 It is much easier to pull the pulks along a path that has already been created by someone skiing in front. We took the decision to take two pulks with us, one for each tent pair. 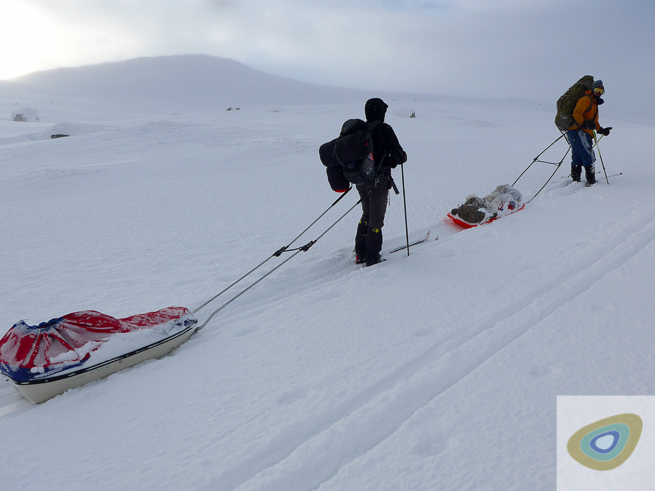 This is a contentious issue, as having the weight of two people’s kit and food make the sleds heavy. The plus side of only having two pulks is that we could at least have a break from pulling for some of the day. That evening, we put up our tents and made hot drinks and dinner to warm through our cold bodies. Having snow all around you to turn into drinking water is great if you have enough fuel and a working stove to melt it. My stove was not working very well, so Daniel and I spent the best part of an hour fixing and cleaning it. I had done this before I left, but it still needed some more work. Luckily Daniel is a great engineer and soon it was back running on full power. One of the issues with winter travel is that there is no way to get water other than melting snow. This is a process that can take time and needs careful monitoring. The next day on our route we headed into the wind and sun for a large part of it. This is difficult for different reasons as when the wind is strong and you must face into it, exposed flesh can get frost bitten very quickly. We continually checked each other’s cheeks and noses to see if they still responded to the sensation of touch. We also had to apply sun screen to stop our faces getting burnt. It was quite a strange situation with the possibility of getting frostbite and sunburn on the same day. That day the wind was strong and made skiing difficult. We decided to drop down to the edge of the plateau to spend the night out of the wind. As soon as we got off the high ground it seemed like a different world and we had the head space to regroup on the edge of the tree line. After going into the wind all day I ended up with a stalactite on my face. I had a cold just before I left for Norway and the last effect of it was clinging on with determination. Once down from the high ground, only 50m - 100m descent, the weather was positively balmy. Clear, sunny skies and no wind to torment us lead to a very enjoyable camp. Daniel and I used our skis and snow shovel to make a perfectly flat area to set up the tent. Once the snow had been trampled with the skis we left it for 15 minutes and it became rock hard. We had also got into the habit of digging a cold well at the entrance to our tent to give somewhere for the cold to go. 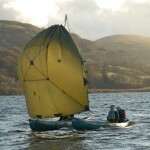 This had the added benefit of making a seat for us to sit on, out of the wind. We then turned our pulk over to create a table in the vestibule of our tent. It was all very civilised. That night was one of the best we had. Our night time routine was slick; we had plenty of hot drinks and a stunning view down in the valley. As the night closed in the clouds parted to treat us to some stunning stars and we enjoyed our shelter from the wind immensely. The next day we headed down the valley to a hut to dry our kit out which was getting damp, and lucked out by meeting Tor, who let us use his drying room and within no time we were back out camping in the snow. After a good night’s sleep our party had to divide. Matt had started to lose sensation in his finger tips and they were showing the first signs of frostbite. 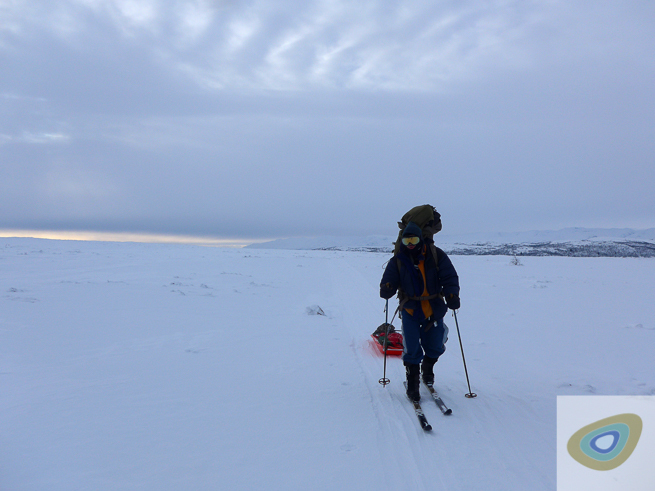 He headed back down the valley to spend the night indoors and the three of us continued back up to the arctic plateau. The route we took was the same route that the Heroes of Telemark had taken down from the Harddangervidda to bomb the heavy water plant. By this point our respect for those brave men had swelled even further. 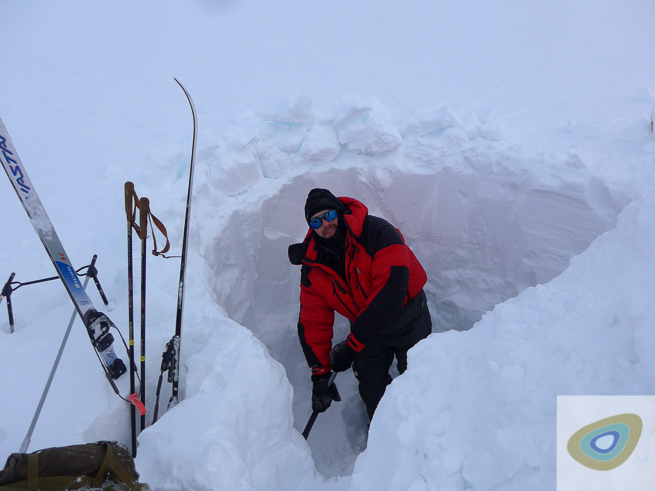 Once back on the plateau, we skied up into the mountains and found an area in the lee of a slope that was not steep enough for an avalanche risk but was possibly deep enough to dig a snow cave. To start with we dug down all the way to the ground, a hole deep enough and big enough for us both to stand in and work in, out of the wind. 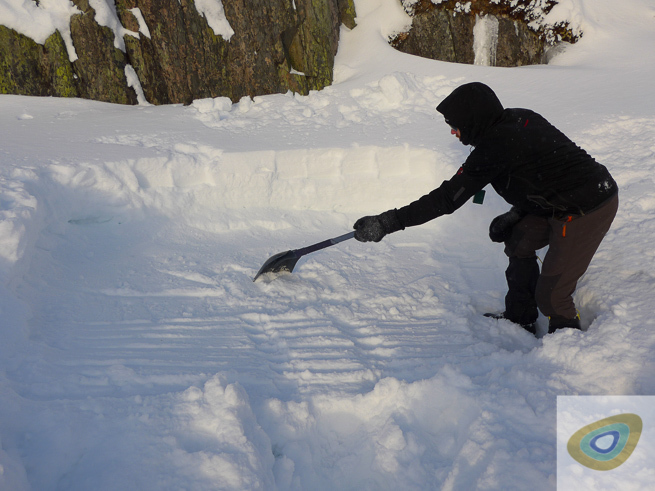 This made a huge difference, as soon as we had the shelter of the snow hole we could get the stove lit and remove our balaclavas. 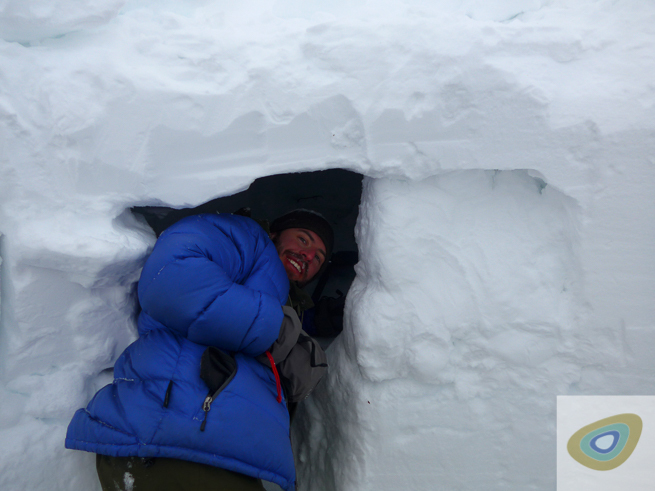 We wanted to dig a snow cave to sleep in as this was something that we had hoped to do since the beginning of the trip. My only concern was that the snow wouldn’t be deep enough, and that it wouldn’t be of good enough quality for making a cave. Sadly, as I dug further back into the cave, the sound of metal on stone revealed my worst fears; there was not quite enough snow for a cave. The snow was not deep enough by about 1 – 2 feet and this would have meant that our sleeping platforms would not allow us to stretch out fully, which would have made for an uncomfortable night. 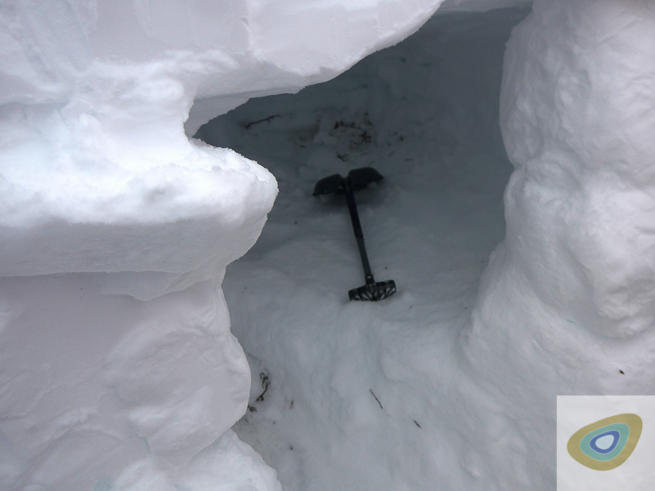 Our plans changed from a snow cave to using the sheltered platform that we had created as the base for our tent. 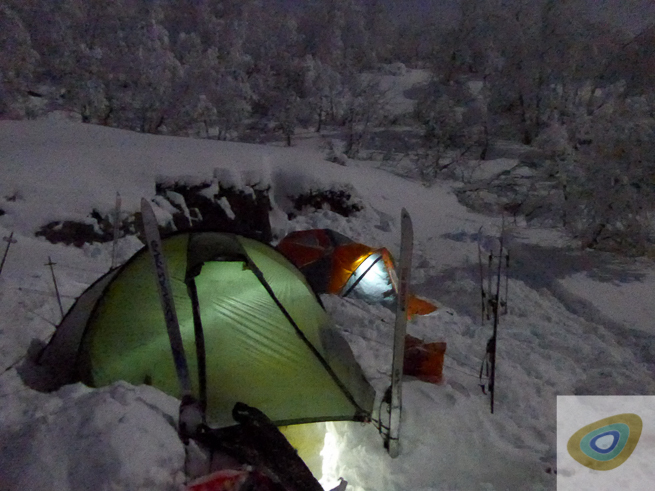 This took more time but did work well, especially because the sheltered snow hole gave us a space to cook and eat. 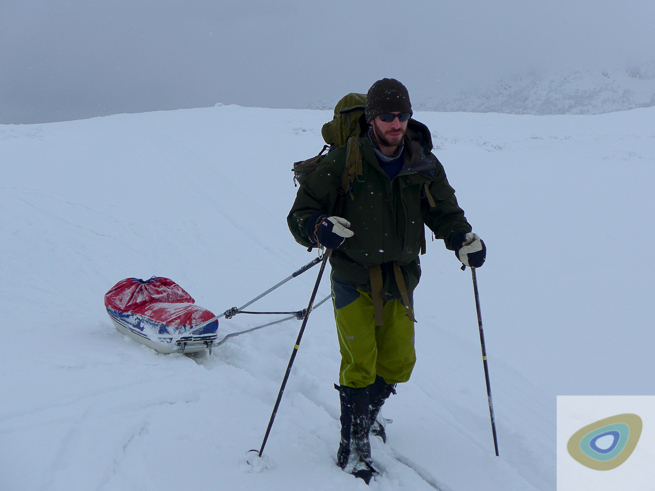 The next morning, we got up and packed our tent and kit for the last time into the pulk. 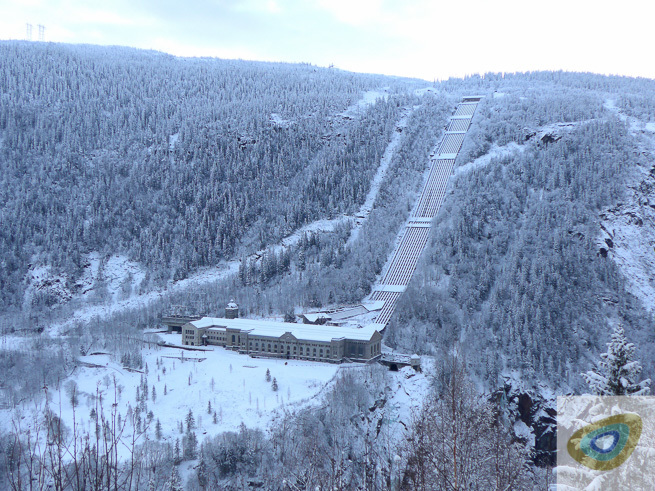 Our plan was to spend our last day visiting the Vermork Hydro Power Plant and using the route the Saboteurs used to descend into the Rjukan valley. We also had to return our skis to the ski hire shop that day and dry and pack all our gear for the flight home. 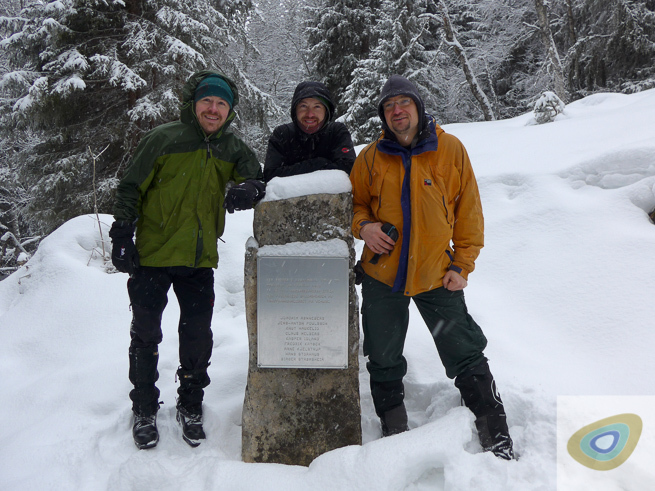 On reflection, after our journey, my respect for the Heroes of Telemark grew even greater. Visiting Vermork and travelling in the land of the Saboteurs is a fantastic experience that I highly recommend. 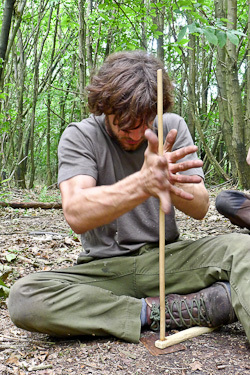 Henry is a member of the Frontier Bushcraft Instructional Team. He has enjoyed the outdoors since he was very young. With family in Scotland and Sussex, every holiday while growing up was spent in one of these places. Continuing his interest in the natural world and embracing travel, Henry has spent time in Africa, Asia, Europe and North America. Henry is a keen canoeist and climber. He holds the Single Pitch Award and is an aspirant Mountain Leader. Thank you Henry. I really enjoyed reading that and the photos were brilliant. Thanks for reading, I’m really glad you enjoyed the article and the photos. Articles like this are a great way to share experiences that can be difficult to fully explain. Awesome article! I just went through our arctic adventure again. Looking forward to our next trip in greenland. Really glad you enjoyed the article, it make for a chilly read!